The June-August 2018 issue of Paycheck is now available. This issue of Paycheck includes new rates of pay in the NSW public sector effective 1 July 2018. New agreements are still to be finalised in QLD and the ACT. Please note that aged care and private hospital wage data is not updated for this quarter. A revised edition will be circulated as soon as this is available. Other updates include changes to demographic data for Patient separations and Higher education applications, offers and acceptances. Weekly wages in the Nurses Award are updated following the Annual wage review increases and changes to Private hospital data following the latest ABS Private Hospital release. Nurses & Midwives' Paycheck is an online service providing comprehensive and timely information on nursing wages from around Australia. Cost: Free for current ANMF, NSWNMA or QNMU members or $35 for non-members per quarterly issue. 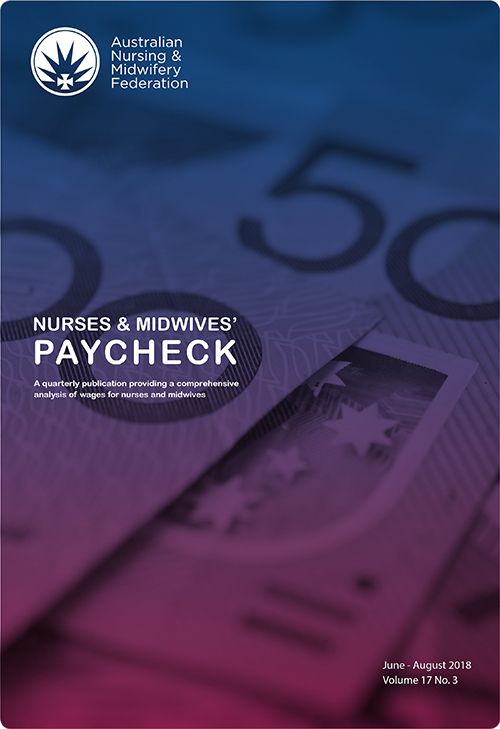 Want a copy of Nurses & Midwives' Paycheck? Please email Anna at anna@anmf.org.au with your name, email address, contact number and membership number (if a member). This unique publication will ensure that nurses, employers and other organisations have this important information at their fingertips. Nurses and Midwives' Paycheck is periodically amended to reflect changes in public sector wage rates with more general updates every three months. **The structure, content and costs of the service have been prepared in consultation with industry bodies and nursing management in the acute, community and aged care sectors in response to calls for a cost effective and accurate publication.